I am a voracious reader. Not in a “I want to read 100 classics this summer” type of way but more in a “I’ve become obsessed with this topic and want to read everything I can get my hands on before the interest burns out” kind of way. My usual routine is to read each night when I go to bed. This has been made especially easy ever since my husband gave me a Kindle for Christmas two years ago because 1) I bought myself a handy little read-anywhere-anytime book light to use with it, and 2) I can (and often do) buy just about any book I feel like reading on a whim. Living in the middle of nowhere (aka Central Montana) with the nearest bookstore more than 100 miles away, this has been a Godsend for someone who loves to read as much as I do. While I tend to save my reading indulgences for bedtime, occasionally a book will get such a grip on me that I literally cannot put it down until I’m done. Such was the case this weekend. 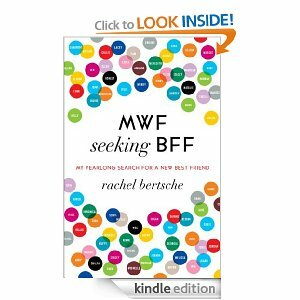 Even though it was just yesterday afternoon, I cannot remember how I stumbled upon MWF Seeking BFF: My Yearlong Search for a New Best Friend. Generally I will read about a book in another book and look it up … or find a link on a website … or occasionally search for a specific topic in the Amazon.com store. But however I ended up with it, I’m glad that I did. The book is written by Rachel Bertsche, a 28-year-old newlywed journalist living in Chicago who decided to embark on a year-long project in search of a new best friend. She first chronicled this experience through her blog (similar to what Gretchin Rubin did with The Happiness Project) and after the year was over, published her story as a book. I found this book so captivating because I can totally relate to Rachel’s struggle to move beyond “casual acquaintance” on the female friendship ladder. Rachel had left her close friends behind in New York when she and her then-boyfriend moved to Chicago. Though she maintained her now long-distance friendships, she craved the kind of connection so many of us remember from our childhoods … the spur-of-the-moment get-togethers, the movie nights, the hanging out and not doing anything really other than talking and just being together. It’s a role hubby just can’t fill, no matter how hard we try, and a level of friendship we so often don’t feel comfortable reaching for with friends we know through work or more recent connections. And as Rachel relates through her story, it’s a role that’s a lot tougher to fill as we get older, thanks to busy schedules, demanding families, and our own insecurities. Often times, we don’t even know how. Following Rachel’s year of “dates” with prospective BFFs … and her commentary throughout … was a great reminder that many of us are experiencing the same thing, even though we tend to believe the grass is greener on that girl’s side of the fence. We tend to think others will not be interested in our pursuit of them as friends. Or that they already have a ton of friends. Or that they will be annoyed if we interrupt their life with a phone call. Or that if they were interested in being friends, they would have called us. Or any number of other reasons that keep us from reaching out and trying to make a connection.